We invite you to click the link below to download from our library of white papers. WaterCube uses a combined cross-sectional and streamwise “go with the flow” measurement technique when spatially sampling depth and 3D velocity in rivers. This allows for high-resolution velocity and depth data to be collected very rapidly covering a vast amount of the river or reservoir. It also significantly improves the ADCP data quality and operational range by minimizing flow resistance and unnecessary motion normally associated with only crossing the river from bank to bank. WaterCube allows for multiple ADCPs to be used simultaneously. Don’t hit the river with just one ADCP! Bring several and capture high quality data faster and farther than ever before. WaterCube will take the output from the multiple ADCP boat-mounted systems and link them together to create a single 3D grid of water velocity and depth. ‘Cube farther, ‘Cube faster, get amazing real 3D views of your data like never before. Finally, to ensure the highest quality results, WaterCube screens all field data providing clean and accurate data for processing. We will incorporate your existing LiDAR data into our processing engine to create a complete DEM or provide the services required to collect terrestrial LiDAR at the time of data collection. This provides the highest precision results when combined with the field data collected underwater. This also saves a significant amount of time compared to traditional methods combining multiple data sets and manually processing results utilizing various programs such as GIS and MATLAB. 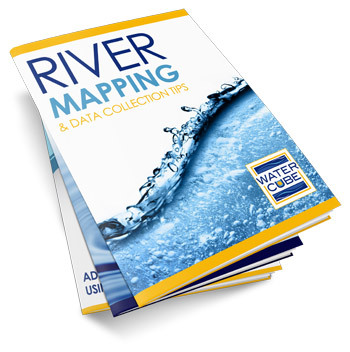 With Watercube, DEM’s and velocity profiles are created in a snap and the results can be used within days of data collection. All Rights © 2019 WaterCube LLC, a Glorious Media Group production.